Captive power generation facilities to provide uninterrupted power backup for entire backup. Modern and fully furnished boys and girls (separate) hostels. A warden and supervisor residing within each hostel. Excellent outdoor & indoor facilities including, Football, Cricket ground, Swimming, Horse riding, Skating, Gymnasium, Table Tennis, and Chess. Spacious and well designed studios for exclusive, teaching, learning, and synergy. Well attended A.C. clinic to meet the first aid needs. 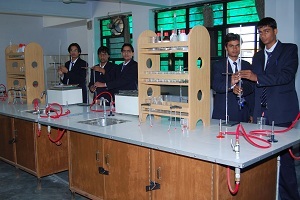 Laboratories and workshops equipped with state of the art equipment and apparatus. The institute has a library with a spacious reading room. The library has a collection of 1000 books and 20 National and International journals. A separate book-bank is also maintained for students. Reverse osmosis water purifying plant with water cooler. Transport: A fleet of college buses to provide transportation to students and staff at their door step. •	Well maintained common room for girls and boys.